Are Buffy and Sabrina Angels or Demons? Witchcraft has come out of the shadows and is entering British society as a viable alternative lifestyle. The Pagan Federation, an umbrella group which represents druids, shamans, witches and high priestesses, is now receiving up to 1000 calls a week. And with more than 120,000 members, being Pagan hardly consigns practitioners to the wacky /sinister fringes of society. Satan has a bid for each teenage, and he is successfully luring many youth today into witchcraft through demonic TV, video games and books. Buffy the Vampire Slayer is an American cult television series that initially aired from March 10, 1997 until May 20, 2003. The entire concept of vampirism is rooted in Satanism. Sadly, many teenagers have adapted to a vampire type of subculture known as GOTH. Sabrina, the Teenage Witch is an American sitcom based on the Archie comic book series Sabrina, the Teenage Witch. Its first four seasons aired on ABC from September 27, 1996 to May 5, 2000; the final three seasons ran on The WB Television Network from September 22, 2000 to April 24, 2003. Only God knows how many teenagers, especially girls, have become involved with witchcraft because of Buffy and Sabrina. God hates witchcraft (Galatians 5:19,20). Teenage magazines such as Mizz promote spells, crystals and tarot cards in their "Spooky" section. Walt Disney's New FLY Pentop Computer for Kids Features the Satanic W.I.T.C.H. Journal. Each letter in W.I.T.C.H. represents the name of an actual witch in the TV series! This is demonic! To no surprise, Toys-R-Us also sells glow-in-the-dark Ouija Boards for your kids to invoke the Devil with. Or how about Glinda the Good Witch Doll for ages 6 and up. Also for sale, the Teen Witch DVD movie for ages 13 and up. Then there's books to lure your child into Wicca witchcraft, such as: The Young Witches Handbook by Kate West (Harper Collins) and Spells for Teenage Witches by Marina Baker (Kyle Cathie). Wicca is a big lie! Wicca is a false religion, which worships hundreds of pagan deities; but vehemently rejects Jesus Christ! According to 1st John 2:22 in the Word of God, Wiccans are LIARS! Buffy the Vampire Slayer, Charmed, Witches, Sabrina the Teenage Witch, Harry Potter, and Witch Academy & Angel are among popular TV programs which Satan has used to attract teens, particularly teenage girls, into Wicca witchcraft. I heard on the news (07-20-07) that Harry Potter fans are extremely excited about the release of the latest Harry Potter in the series, The Deathly Hallows. Fox News featured the following www.mugglenet.com, operated by Emerson Spartz. The website was started when Emerson was only 12 years old, and now he is 20. Mr. Spartz admitted to Fox News that he is paying for his college tuition with proceeds from his website. Unbelievably, the website receives 40,000,000 web visitors per month according to Mr. Spartz ... that's 480,000,000 web hits PER YEAR! It clearly shows just how demonic the world has become, and the extent to which Satan is using Harry Potter to demonically influence children. The Pagan Federation, which represents druids and witches, says it has been "swamped" with calls following teenage programs featuring good witches. Speaking to BBC News Online the Pagan Federation's Steve Paine, the high priest of a coven, said the hit US drama Buffy and the highly successful Harry Potter books were popular amongst practicing witches ... Most of the enquiries are from 14 to 18 year-olds, and are dealt with "reactively" by a specially-appointed youth officer, an Essex based schoolteacher." John Buckeridge, who edits the magazine YOUTHWORK, says teenagers who experiment with Paganism are opening themselves up "to dangerous occult links." This is certainly true. YOUTHWORK also claims that television shows such as Sabrina the Teenage Witch and Buffy The Vampire Slayer are playing their part in corrupting youth. "If kids watch Sabrina they will learn the rituals of the occult and that could open a doorway to danger," says Buckeridge. I couldn't agree more with Mr. Buckeridge. Any spirit that is not the Holy Spirit is a familiar spirit... "Regard not them that have familiar spirits, neither seek after wizards, to be defiled by them: I am the LORD your God" (Leviticus 19:31). It is a serious matter to God. Every form of witchcraft draws young people away from the precious Word of God and from the knowledge of the truth found only in Jesus Christ (John 14:6). Biblically, witchcraft can be defined as seeking guidance, information or power from any spiritual source other than God. Thus, all forms of occultism, psychics, horoscopes, astrology, palm reading, and such are demonic. Animism is the basis of Wicca and of Hinduism: The "Life Force" is the soul or anima of everything... of a rock, a tree, a star, an animal, a human... so, all is sacred; all is to be cared for and revered. Everything on earth or the sky is like a drop of water of the same ocean which is the Life Force, the Absolute. Polytheism is the next obvious consequence: There are thousands of gods... the concept of 333 million deities is believed to emphasize the fundamental doctrine of Hinduism and Wicca. The first verse of the Bible contradicts these views: In the beginning God created the heavens and the earth. So, in the Bible, there is one God, a Person, and everything else in the world was created by God. God created the soul and all life, and preserves His creation; but everything is not God... there is only one God, our Creator, Jesus Christ (John 1:1-3; Colossians 1:16). There is only one God (Deuteronomy 6:4); who had manifest Himself to mankind in the form of a Divine Godhead (Matthew 28:19; Romans 1:20; Colossians 2:9); namely, God the Father, God the Son, and God the Holy Spirit. Of course, for any Wiccan or Hindu, the aim of this life is to stop the relentless and frightful reincarnation, and become nothingness, not a real person, but the drop of water in the ocean of the Absolute. However, in striking contrast, for a Christian an eternal life of joy is waiting (John 16:22), and not like a drop of water, but as a person, recognizable by God and by every neighbor... a person!, an individual!, eternally!, as God is an eternal Person! John 14:1 states, "Let not your heart be troubled: ye believe in God, believe also in me. In my Father's house are many mansions: if it were not so, I would have told you. I go to prepare a place for you." Amen! According to Wicca and Hinduism, All "religions" are true ... all religions that is, except Christianity. But, are all religions true?... if one person says there is one God, and another says there is not God, and another says there are thousands of God, are all of them right?... the Branch Davidians of WACO, Texas, USA?... The People's Temple of Jim Jones in Jonestown, Guayana, with the 913 members poisoned in 1978?... and what about you, my dear Wiccan?... are you "sure" Hell and Satan do not exist?... what about if after death you learn that they exist?... suffering forever in the flames of the lake of Fire!... not as a drop of water in the ocean; but as a person!... an individual! Most Wiccans do not believe in Heaven or Hell, but they do believe that their soul lives on after the body fades. They believe in the Hindu reincarnation, which is a lie of Satan to enslave most of the Eastern culture, and the main reason for the infamous "Caste System" in India, which is the most "intolerant" and "prejudice" system in the history of the human race. Witchcraft is inherently Satanic according to the Bible, whether Wiccans realize it or not. Yes, but they don't realize it. Wiccans are adamant that they don't even believe in Satan. To Wiccans, "Satan" is a term only used by Christians. However, Wiccans greatly contradict themselves when they profess to recognize "Lucifer" (which is also taught in the Christian Bible). 2nd Corinthians 11:13-15 give us remarkable insight into the character and nature of Satan, "For such are false apostles, deceitful workers, transforming themselves into the apostles of Christ. And no marvel; for Satan himself is transformed into an angel of light. Therefore it is no great thing if his ministers also be transformed as the ministers of righteousness; whose end shall be according to their works." Biblically, Satan often comes to people in the form of an angel of light, i.e., as a wolf in sheep's clothing (Matthew 7:15). "Why is it I see so few men in Wicca? For the simple fact Men are looked down upon by these Feminist and often Sadistic Wiccans, and most of the men in Wicca are Homosexual anyway." 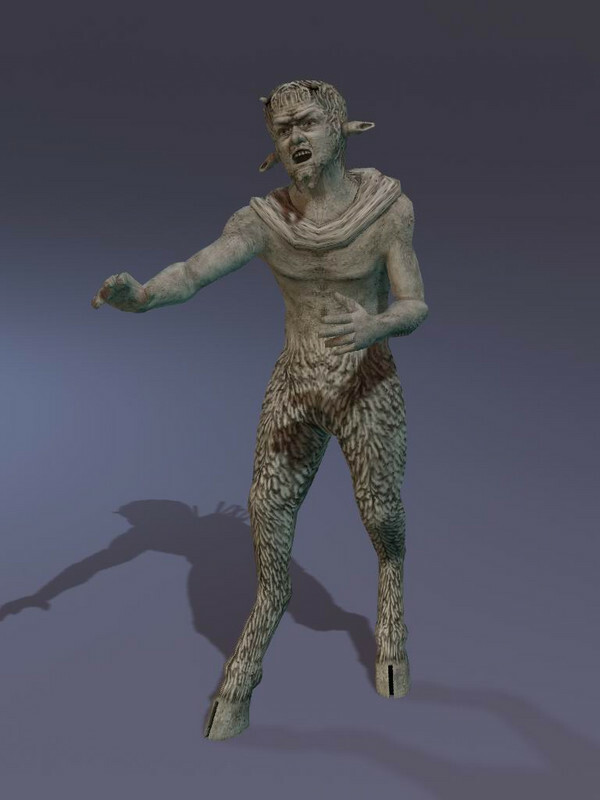 "It is likely that the demonized images of the incubus and even the horns and cloven hooves of Satan, as depicted in much Christian literature and art, were taken from the images of the highly sexual Pan." Only a blinded fool would even try to sugarcoat something as vile and wicked as witchcraft. Wicca was actually founded by an occult Freemason, Gerald Gardner (1884-1964). In fact, many false religions have been founded by Freemason occultists, including Mormon founder, Joseph Smith who was a 33rd degree Freemason; and Jehovah's Witness founder, Charles Taze Russell, who was also a 33rd degree Freemason. See: Religions: The Occult Connection. Modern witchcraft isn’t a survival; but a contemporary invention based on the books of a strange Oxford scholar, Margaret Murray, or more recently on Gerald Gardner’s ‘Witchcraft Today’ published in 1954 after the repeal of the witchcraft law in 1951. David Burnett in his book Dawning of the Pagan Moon (ISBN-10: 0840796447) has identified four streams in contemporary neo-paganism: Wicca, or practitioners of the craft of witchcraft; Pagans, who follow the pre-Christian European traditions; and Magicians. The fourth stream is Satanism, which stands separate from the others because of its explicitly anti-Christian position. The Bible groups these all together as heathendom. Jeremiah 10:2, "Thus saith the LORD, Learn not the way of the heathen..." 1st John 2:22 states, "Who is a liar but he that denieth that Jesus is the Christ? He is antichrist, that denieth the Father and the Son." Wiccans are liars, because they deny that Jesus is the only Savior! I plead with you young person (and not to be unkind in any way), run as fast as you can from witchcraft, because it will damn your soul to Hellfire! Witchcraft is a horrible sin. In 1st Samuel 15:23, God equates witchcraft to the sin of rebellion: "For rebellion is as the sin of witchcraft..." Again in Galatians 5:19,20 we read that "witchcraft" is listed as one of the works of the flesh which bring the judgment of God. In sharp contrast, the Word of God does NOT teach a feminine side of the Godhead. The God of the Bible is portrayed in the Scriptures as a masculine God. What Should Christians Do About Witchcraft? We read in 2nd Corinthians 6:14,17: "Be ye not unequally yoked together with unbelievers: for what fellowship hath righteousness with unrighteousness? and what communion hath light with darkness? ... Wherefore come out from among them, and be ye separate, saith the Lord, and touch not the unclean thing; and I will receive you." There's our Biblical answer... Wherefore come out from among them! Tragically, public school children all across America are being shown Harry Potter movies by their teachers. Scholastic, the company that publishes books for the public school system, wants to get the trilogy of Philip Pullman into the hands of children. Pullman, as mentioned earlier, hates God and wrote The Golden Compass to steer children away from God. Those Godless hypocrites won't teach children about God; but they'll teach them about witchcraft. In his book "The Expanded Chocolate Teapot" (ISBN: 1859990819), David Lawrence explains that for many young Christians their first contact with witchcraft and the occult comes from their peers in secondary school. He gives 8 points of practical advice for those who come up against, or have become involved in: Ouija boards, crystal balls, astrology (horoscopes), mind reading, levitation, palm reading, tarot cards and séances. DON’T...DON’T...DON’T!! Even if your friends urge you to join in...DON’T...DON’T...DON’T!! 2. Don’t be frightened of evil spirits. They cannot just choose to hurt you, you have to give them the chance (for example by joining in activities like those listed above) - so don’t! 3. If you have been involved in any occult activities in the past then DON’T PANIC, just read on. 4. Although Satan has the power to hurt people who get too close to him, his power is not unstoppable! Jesus Christ has the power to destroy all the harmful effects of what Satan tries to do. This is what the Bible has to say on the subject: The Son of God (Jesus) appeared for this very reason, to destroy what the devil (Satan) had done [1 John 3 v8] If the Son (Jesus) sets you free, you will be free indeed [John 8 v34]. 6. Pray to Jesus. Tell him how sorry you are for letting Satan influence your life. Ask him to ‘throw out’ anything harmful which may be affecting you. 7. Ask Jesus to fill your mind & spirit with his Holy Spirit. 8. Talk to an older Christian about your experiences. Show them this and ask them to pray with you. Ask for their advice about how to stay close to Jesus. This may seem like a hard thing to do, but if you’ve been involved with occult powers or witchcraft you do need the help of an older Christian, so pluck up all your courage and...GO FOR IT! Satan only comes to kill, steal and destroy (John 10:10). Satan has no will for your life young person, except to prevent you from doing God's will. Wicca is a religion for misfits. Young people who come from less than ideal homes often feel awkward, unwanted and unloved. Wicca claims to be a loving religion that is environmentally conscious, acceptant of all religions and not judgmental of others. This naturally attracts young people, especially teenage girls who gravitate toward the recognition of a female deity (i.e., goddess worship). 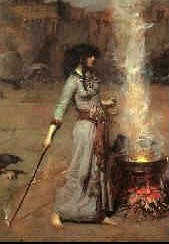 Wicca is inseparably related to feminism, which is rooted in rebellion. However, the important question that we need to ask is: What does the Bible say? The Bible is God's Word. Wiccan witches hate the Bible, because It condemns them. Homosexuals hate the Bible, because It condemns them. Idolaters hate the Bible, because It condemns them. Adulterers hate the Bible, because It condemns them. Romans 3:19 states, "Now we know that what things soever the law saith, it saith to them who are under the law: that every mouth may be stopped, and all the world may become guilty before God." God's Law condemns all of us, because we are all sinners. The purpose of God's Holy Law is to show us our sinful condition, and thus, our need for the Savior Jesus Christ, "Wherefore the law was our schoolmaster to bring us unto Christ, that we might be justified by faith. But after that faith is come, we are no longer under a schoolmaster." God doesn't just condemn us and leave us without hope. No, rather, He gave His only begotten Son to die and pay for our sins with His own shed blood (1st Peter 1:18,19). Eternal life is a free gift (Romans 5:15;6:23), paid for by Jesus' blood (1st John 1:7; Revelation 1:5). Witches ultimately worship the creation, not the Creator (Romans 1:25). Wicca fails to address the issue of sin. They instead believe in Karma, i.e., that their next reincarnated life will be determined by how they live in this life. Howbeit, Wiccans do not recognize the term or concept of "sin," i.e., breaking God's Laws. Sin is against God. Only through the cross of Jesus Christ can we be reconciled with God... "Therefore being justified by faith, we have peace with God through our Lord Jesus Christ" (Romans 5:1). Jesus said in John 3:3, "Ye must be born again." Trying to bring oneself into harmony with nature cannot substitute for Biblical repentance. The Word of God incontrovertibly states that witchcraft and Christianity cannot co-exist. James 4:4 plainly states that friendship with the sinful world makes one the enemy of God. Thankfully, the Gospel of Jesus Christ destroys the power of darkness and the works of the Devil, which certainly includes witchcraft. Buffy the Vampire Slayer and Sabrina the Witch are demonic, because the Bible condemns using familiar spirits. There are only two sources of spiritual power in this universe: God and Satan. So the question we need to ask ourselves is: What types of spirit is behind Buffy and Sabrina? They may appear as "angels," but they have been transformed from demons to fool you! "Beloved, believe not every spirit, but try the spirits whether they are of God..." (1st John 4:1). The spirit at work behind Buffy and Sabrina is a demonic spirit of lasciviousness, rebellion, and witchcraft. Angels? I think not!